Homemade is different! 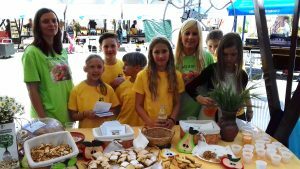 That was the message which students from the Primary School in Ptuj presented to others at the event called Slovenian farms, held at the Altermed Fair. 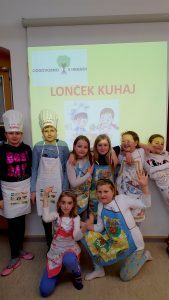 They were ready to demonstrate their thorough research of old Slovenian traditional dishes and folk tradition products. However, the event was preceded by months of hard work, research, discussions and studying. The goal of the We Eat Responsibly project was to teach students and their parents about the numerous advantages of consuming local and seasonal food; inspiring motivation to change shopping habits and food choices to improve not only health but also the health of our planet. Students had the opportunity to discuss many food issues with suppliers, caterers and producers, which helped them reveal the global effects of local food production. Thanks to these discussions they discovered the real benefits of Slovenian traditional food. Consequently, they created informational posters on this topic and a local food pyramid concerning Slovenian products. Of course, they were not merely talking about food, but also cooking and tasting it! 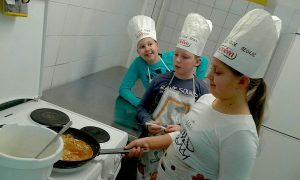 During „Little pot, cook!“ class they tried various traditional Slovenian dishes. They learnt not only old recipes, but mainly how to prepare those meals. 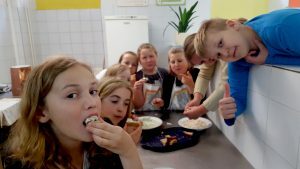 Every week students cooked attractive vegetarian food for their schoolmates which was a real success. 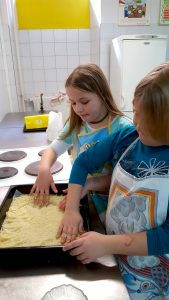 Cauliflower pizza, hamburger from millet porridge, homemade chocolate pudding… Everyone adored it. Students even controlled and recorded the amount of food waste at their school. Firstly, they learnt a lot about the eating habits of others. Subsequently they were able to lead several activities to reduce food waste. They started by writing a food diary and decided to improve the atmosphere in their canteen by decorating it by pictograms. They also established two special corners – the „Eat me“ corner, where students could leave food they did not want for others with still room in their bellies, and a corner for tasting and self-service of meals. Students were so creative that they even performed a cooking show! Indeed, the We Eat Responsibly project has held many attractive activities which improved students´ critical thinking. 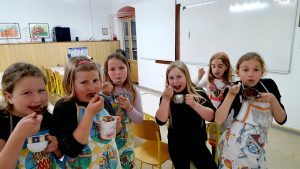 It helped them gain new information and knowledge, develop new consumption habits and behavior patterns and reminded them of the important values connected with food – health, respect for nature, responsibility, moderation, solidarity and consideration. Students highlighted that every person could make a change when thinking globally and acting locally. Everyone can contribute to the fight against climate change and other challenges!